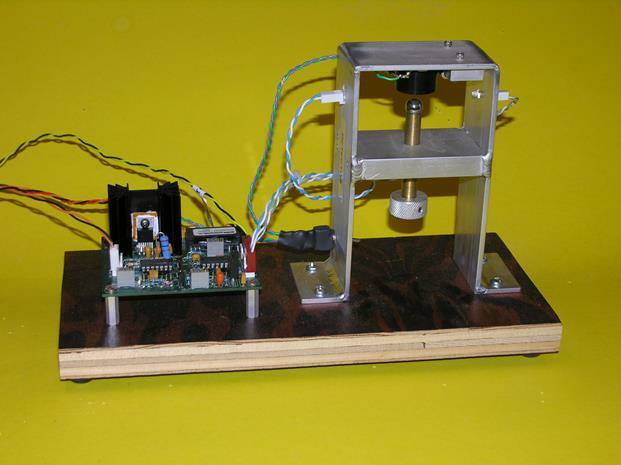 In this lab you will learn how to extract signals from noise, and how to use a PID controller. Several LabVIEW programs are mentioned in this lab writeup. Many of these programs can be downloaded from 111lab/BSC Share\ on the U; Drive from the 111-Lab computers. Two versions of the programs are typically available for download: an executable version that should run without LabVIEW (but requires a large download from National Instruments, which should occur automatically, and only needs to be done once) and should run on PC’s, Mac’s and Linux boxes; and the original LabVIEW source code which requires LabVIEW. To do Calculations use MatLab or outside the lab use RStudio (freeware). 1. You seek to detect a signal of intrinsic frequency spread Hz with a room temperature detector that has an impedance of 1000ohms. You sample for 10ms. What is the smallest signal that you can detect? There are many ways to implement each of these techniques; we will explore the most important. All signals have some intrinsic frequency spread, and the bandwidth cannot be made smaller than this spread. The two most important Bandwidth narrowing techniques are filtering and Fourier Transforming. Filtering narrows the bandwidth directly, attenuating the out-of-band noise. Fourier Transforming also narrows the bandwidth, but by a more subtle method. While it does not attenuate the noise, it allows you to concentrate on the narrow portion of the spectrum that contains your signal, thereby ignoring the majority of the noise which is spread through the entire spectrum. · Anti-aliasing. You must attenuate the frequencies above the Nyquist frequency before the signal has been digitized. · Amplifier chains. It is not uncommon for noise to swamp the later amplifiers in the a high gain amplifier chain. If, for instance, you have a signal masked by noise, and you use an amplifier chain with a gain of one million, the noise would be amplified to , saturating the final amplifier which is unlikely to be able to output much more than . You would not be able to detect your now signal. However, if you use a filter early in your amplifier chain, you can get rid of most of the noise, and prevent it from saturating the chain. In applications where analog filtering is not required, digital filtering is often superior. Digital filters are far more flexible, can be made arbitrarily sharp, are trivially tunable, and their topology (RC, Butterworth, Chebyshev, Bessel, etc.) is easily changeable. However digital filters are computationally intensive, and their use is limited to relatively low frequencies. Moreover, digital filters necessarily operate on digitized waveforms, and are subject to all of the limitations (Nyquist theorem, quantization) of the digitization process. Digital filters are difficult to design. Fortunately, there are many canned routines available, including an extensive suite in LabVIEW. We need not worry too much about the differences between the types of digital filters; refer to Chapter 3 of the LabVIEW Analysis Concepts manual for more information. In particular, Figure 3.25 of this reference shows a handy flowchart for picking the correct filter type. The Fourier transform of a sinusoid is a delta function centered at the frequency of the sinusoid. The first zeroes of this function occur at , or , where and is the number of cycles of the wave in one sample. Because the pulse width is finite, we cannot readily determine the precise frequency of the original signal. Consider a signal that is actually the sum of two equal amplitude sine waves of frequency and . The plots below show this signal, in green, compared to a pure signal of frequency , in red, for various values of . The spectra are indistinguishable for , and nearly so for . Aside from an unimportant change in the amplitude, the spectra for are distinguishable only by the details of the secondary peaks surrounding the main peak; the width of the main peak is very close to that of the pure signal. Only when are the spectra easily distinguishable. Yet the untransformed original signals are readily distinguishable. Thus, given only the spectrum, we cannot determine the frequency to better than about : one quarter of the width to the first zero calculated above. In essence, we have an uncertainty principle: the longer we sample a signal (the greater the time uncertainty), the better we know the frequency of the signal. Discrete Fourier Transformers would have little practical value if they could not be evaluated quickly. Casually, one might think that the evaluating the transform would require evaluating exponentials: for each of the samples. Thus, the transform of a signal represented by a 100,000 samples would appear to take 10,000 times longer to evaluate than a signal represented by 1000 samples. As the accuracy of the transform increases with the sample length, this would be very unfortunate. Fortunately, there are clever algorithms which reduce the evaluation time scaling to : a 100,000 sample representation takes only 665 times longer than a 1000 sample representation. These algorithms are called Fast Fourier Transforms, or FFTs. They are generally attributed to J. W. Cooley and J. W. Tukey, who published an implementation in 1965, but many others, including Gauss, had discovered similar algorithms. The FFT algorithm works most naturally on samples lengths which are powers of 2. However sample lengths which are factorable into the products of powers of small primes, such as can also be transformed efficiently; stick to sample lengths which can be so represented. If necessary, pad your sample with zeros to extend it to one of these lengths. In practice, sample lengths below one million can be converted remarkably quickly. Longer sample are slower than would be predicted by scaling because of cache misses. Once the sample gets large enough to require virtual memory disk accesses, conversion is painfully slow. Experiments frequently produce multiple instances of the same signal. 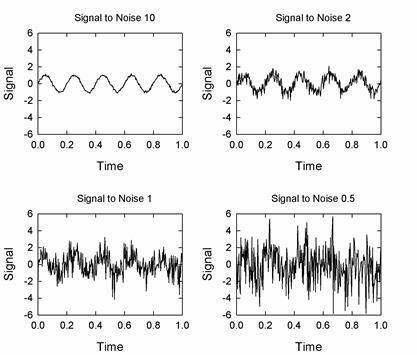 Averaging the instances can improve the signal-to-noise ratio if the signal itself is repetitive, and the noise uncorrelated from instance to instance. Then the noise will diminish as , where is the number of instances. Note that the signal must be truly repetitive, otherwise it will average away just like the noise. Also note that because of the square root dependence, successive factor of two noise reductions becomes increasingly painful. As you saw in Exercise 10.2, humans are remarkably good at recognizing some sorts of signals in the presence of noise. Computer algorithms exist that can sometimes do the same. The simplest is the well-known linear least squares algorithm. If you know your data lies on a line, why retain the individual data points? By fitting the data to a line you can average most of the noise away. The linear least squares algorithm is easily generalized to fit polynomial coefficients to data, or even linear combinations of nonlinear functions. More powerful methods are needed to fit nonlinear equations. One of the most common is the Levenberg-Marquardt algorithm, which will fit one or more unknown coefficients in a nonlinear expression to a data set. Given a reasonable guess for the unknown coefficients, it can work remarkably well. The algorithm is quite difficult to program; fortunately, LabVIEW comes with an implementation. The techniques discussed above all assume that the data from your ADC is near perfect: that the sample rate is high and that quantization is unimportant. It is sometimes possible to improve your sample data when these conditions are not met. 1. Be sampling a rigidly periodic waveform. 2. Use an ADC whose bandwidth exceeds the bandwidth of the signal that you wish to recover. a. First, obtaining an analog sample of the instantaneous signal level. b. Second, presenting this analog sample to the analog to digital converter. Note that the actual signal may change during the conversion time, but this will not affect the conversion since the signal being converted is the previously obtained analog sample, not the current signal. Acquiring and storing an analog sample may seem difficult, but, in fact, is easy to do with a common circuit called a sample and hold. On command, the sample remembers the analog value at its input, typically by storing the value in a capacitor. If your system does meet these requirements, you can acquire an accurate sample of a waveform by following these steps. 1. After receiving a trigger indicating the beginning of your waveform, acquire one sample set. Note that the sample rate can be well less than twice the signal frequency. 2. After receiving a second trigger, wait for a delay interval less than the time between samples, and then acquire a second sample set. Interleave this second set with the first set, offsetting each point by the initial interval. 3. After receiving a third and successive triggers, acquire and interleave more data sets, each offset by a different amount. The offsets can be evenly and incrementally spaced, or can be random. ADCs add quantization noise to low level signals. For example, the near-zero levels of a 10 bit ADC, with a range of are -59, -39, -20, 0, 20, and 59mV. The ADC cannot represent signals in between these levels. This is particularly problematic for signals that are less than 10mV; the ADC will convert the signal to the constant 0mV, and the signal will disappear entirely. Paradoxically, adding random noise will improve the conversions. If the noise is sufficiently large, it will cause the signal to fluctuate between the ADC quantization levels. The average of the levels reported by the ADC will be the signal level. This technique is called dithering, and is quite commonly used. Noise adding circuitry may be incorporated in the ADC, or you may have to add noise yourself. Often, the natural noise in your system is often enough to dither. As and example, consider a steady 9mV signal. Without noise, the aforementioned ADC will always convert this signal to 0mV. Add 10mV noise however, and the signal will range between -1mV and 19mV, with occasional larger excursions. Roughly eleven times out of twenty, the signal will be between -1 and 10mV and will be converted to zero, while nine times out of twenty the signal will be between 10 and 19mV and will be converted to 20mV Thus, the average of the converted signals will be 9mV, thereby recovering the original signal level. If the sample rate is much higher than the desired signal frequency, the averaging can be done by passing the converted signal through a digital low pass or smoothing filter. If the signal is periodic, and multiple instances of the signal are available, the signal can be further improved by averaging the instances. The ideal noise level is about half a quantization step. Below this noise level the signal will not fluctuate between steps, and above this level the noise itself introduces error. On/Off Controllers. Epitomized by a light switch, a typical experimental function would be controlling the state of a vacuum valve. On/off controls are trivial to program; they are usually implemented by controlling the state of a digital bit, which in turn, controls an electronic switch. On/Off controls are all or nothing; you cannot use them to reach a particular level or state. Continuous Controllers. A stovetop burner valve exemplifies of a continuous control; a control that lets us set the state of the driven object to a continuous set of levels. A typical experimental function would be controlling the strength of a magnetic field. Continuous controls are commonly implemented by using the voltage from a DAC to control the target device: a power supply, for instance to control the current through a magnet. A continuous control allows some systems, like a magnet, to reach a well defined state. Most systems, however, are not so strictly controlled. Sometimes a system will appear to be stably set to some level, but a perturbation or change in system can run it out of control. For instance, a stove top burner cannot be programmed to reach and hold a particular temperature. Temporary control can be achieved by setting a pot of water on stove burner. The water and pot will get no hotter than 100C. But once the water boils away, the temperature will rise uncontrollably. Having once melted through an aluminum pot, which requires a temperature of 660C, I am all too familiar with this scenario. Feedback Controllers. A feedback control adds feedback to a On/Off control; a thermostat is a familiar feedback control. The control turns on some device (a heater in the case of a thermostat) until some setpoint is reached. Then the control turns off the device until the process variable7 falls below the setpoint, at which point the device is turned back on. Feedback controls are common in experiments and are used to accomplish tasks like keeping a process at a specified temperature, or a fluid level at a specified height. But feedback controls are too crude for many applications. Proportional Controllers. When you merge onto a highway, you gun your engine in the acceleration lane until your speed approaches the traffic speed, and then ease off as you match your speed to the traffic speed. If you were to accelerate at low power, you would reach the end of the acceleration lane before you attained sufficient speed, and if you did not ease off toward the end, your attempt to match the traffic speed would be very jerky. This control methodology is an example of proportional control; the strength of the drive is proportional to the difference between the setpoint and the process variable. Proportional control is appropriate when you wish to quickly approach a setpoint, and then asymptote to it smoothly. As gets large, the process variable will approach the setpoint . The inertia in mechanical systems is explicit, but even non-mechanical systems exhibit inertia-like phenomena. For instance, thermostatically controlled heating systems have a form of inertia. Typically, the thermostat is not immediately adjacent to the heater. When the temperature at the thermostat exceeds the setpoint, the thermostat will turn the heater off, but the area near the heater will be warmer than the area near the thermostat. Heat will spread away from the heater, and the temperature at the thermostat will continue to rise, until the temperature equalizes everywhere. Thus, the system has inertia just like the spring-mass system. In general, any system with time delays will have inertia-like properties. 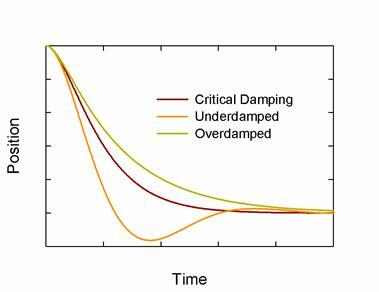 Adding damping through a differential term is frequently beneficial. The integral term integrates the difference between the process variable and the set point, and drives this error to zero. Like the integral constant has units of time. The most difficult step in deploying a PID controller is determining the constants and There is no foolproof method that always gives the best values. For that matter, there is no single set of “best values;” the best values depend on the desired response time, and your ring and overshoot tolerances. If the system is very simple you may be able to calculate the values, otherwise you will have to guess them or find them by trial and error. Once you get values that keep the system stable, you may be able to use various algorithms to optimize them. Some of these optimization algorithms are available in LabVIEW. Finding the appropriate constants is called tuning the PID. Practical PID controllers work by calculating the error, between the process variable and the setpoint, integrating and differentiating the error, scaling by the appropriate constants, and summing to get a drive signal. PIDs can be implemented in analog or digital. Analog PIDs output a continuous voltage. Digital PIDs operate in a loop: they measure the process variable, compute the drive and output it with a DAC, and loop back to measuring the process variable. Consequently, the drive from a digital PID is a series of steps. Whether implemented in analog or digital, the system has a finite response time. If analog, the response time is set by the bandwidth of the circuitry. If digital, the response time is set by the speed of the ADC and DAC, the computation time of the calculation, and by any other tasks that might be running on the processor that distract the processor’s attention. The sum of all these times is called the service interval. As a rule of thumb, PID controllers work well if their bandwidth is a factor of ten higher than the frequency with which changes occur in the process. Software implementations are easier to tune, and can be easier to integrate into a bigger system. On dedicated hardware, software PID loops can run quite fast. But in the Windows environment, operating system distractions limit the PID loop speed to about 1kHz. Hardware implementations can be much faster. 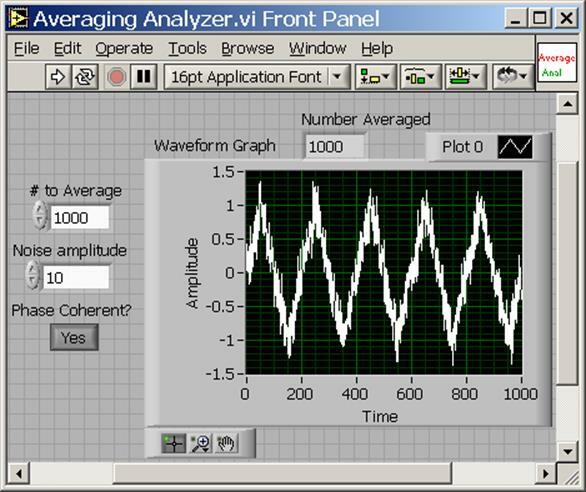 Use the program Filter.vi to generate a sine wave with the Signal Amplitude set to 1, the Signal Frequency set to 75, and the Modulation Frequency set to 0.1. Turn of all noise. Pass the signal through a Butterworth filter of Filter Order 3, with a High Pass Cutoff of 80 and a Low Pass Cutoff of 70. Study the synchronicity of the filtered signal; do the modulation minima of the filter signal occur at the same time as the minima of the unfiltered signal? Decrease the bandpass; how does the synchronicity behave? Now study the amplitude of the filtered signal. How narrow can you make the bandpass before the amplitude of the signal decreases? Change the Modulation Frequency to 1. Now how narrow can you make the bandpass? How does the minimum acceptable bandpass scale with the modulation frequency? Can you explain this scaling? Record your answers in your lab book. Restore the original (default) parameters. Turn on the 60Hz Comb Noise, which adds noise at 60Hz harmonics. What happens to the unfiltered signal? What about the filtered signal? How low can you make the signal amplitude and still recover the original signal? Decrease the bandpass to the minimum values that you found in 11.1. How small a signal can you recover? How well does the filter remove the 60Hz noise? Record your answers in your lab book. Restore the original (default) parameters. Turn off the 60Hz Comb Noise and turn on the White Noise, which adds noise. For bandwidths of 10, 1 and 0.1Hz, how much noise should get through the filter? What is the smallest signal you should be able to observe? Confirm your predictions by running the program. 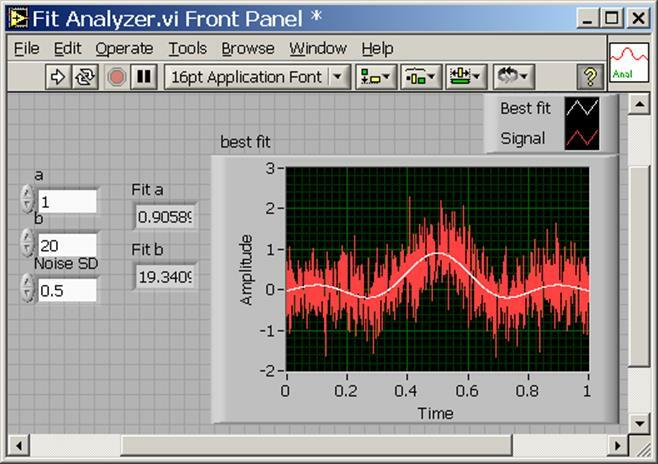 Use the program FFT Analyzer to explore Fourier Transforms. With a Signal Frequency of 75, Signal Amplitude of 1, Noise Amplitude and 60Hz Comb Amplitude of 0, Sampling Rate of 1000, and # of Samples of 10000, turn off autoscaling on the FFT Frequency axis and expand the axis to view the peak at 75. Use the “Common Plots” option on the FFT graph to turn on the display of the individual data points. How wide is the peak in Frequency? How wide is the peak in points? How wide would you predict it to be? Change the Signal Frequency in increments of 0.01Hz. How does the peak width change? Now change the # of Samples. How does the width change? Does it conform to your predictions? Record your answers in you lab book. Using the same program, turn the FFT frequency axis autoscaling back on. Restore the common plots to plotting a simple line. 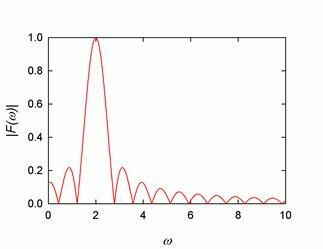 What is the highest frequency plotted? What would you expect? How does the highest frequency scale with the sampling rate? Record your answers in your lab book. Now set the 60Hz Comb Amplitude to 1. Turn off autoscaling, and expand the FFT frequency axis to view the 75Hz signal. Change the Signal Frequency; how close can you bring it to 60Hz and still differentiate your signal from the 60Hz Comb Signal? How does this depend on the # of Samples? Turn the 60Hz Comb off, set the White Noise Amplitude to 1, and change One Shot to Cycle Repetitively . How small a signal can you pick out of the noise? Explore the effects of varying the number of instances on recovering the signal from various amounts of noise. Show that threshold for successfully recovering the signal scales appropriately. Report the results in you lab notebook. Exercise the routine with different combinations of the noise and parameters a and b. How well does it work? The middle block is the Sort 1D Array operator, and the remaining operators pack and unpack the arrays into arrays of clusters. While demonstrating your routine to the TA’s, explain how this code sample works. The routine Dither.vi demonstrates the virtues of dithering. The routine generates a sine wave with sample rate 10kHz, superimposes noise, and quantizes the total signal to integer levels. It then passes the signal through a 20mS smoothing filter, and finally averages multiple instance of the signal. Starting with a Signal Amplitude of 0.75 and a Noise Amplitude of 0, run the routine to see the quantized, smoothed, and smoothed and averaged signal. Then increase the noise until you get a reasonable facsimile of the sine wave. How much noise do you need? Now decrease the Signal Amplitude to 0.1 and again find the minimum noise level that extracts the signal. What happens when you make the noise large? Does the signal degrade? Now set the # to Average to 1000. Approximately how small a signal can you detect? How would you predict this value? (Hint-Remember that even before the instances are averaged, the smoothing operation average samples for 20mS.) Explain your reasoning to the TAs. The following exercises use a computer controlled PID loop to control a magnetic levitator. The levitator suspends a steel ball underneath an electromagnet. The magnet field is controlled by the computer based on feedback from a position sensor. The sensor measures the position of the ball by shining an infrared light beam between the ball and the magnet. The ball partially occludes the light beam; from the amount of light that passes by, the sensor can determine the ball’s position. The computer ADC cannot put out enough current to drive the electromagnet directly. We provide a small circuit that amplifies the ADC output. The circuit also drives the infrared source and amplifies the signal from the light sensor. The circuit needs 0, +12 and +24V power from the breadboard power supplies. Make sure you ground the connector that is labelled "-12 VDC" on the breadboard, not the connector that is labelled "0 VDC" on the breadboard. See photo of breadboard in Lab 1 if you are reading this remotely. (This is NOT the usual arrangement with the middle connector of the upper three connectors grounded). SWITCH OFF THE POWER ON THE SIDE OF THE BREADBOARD. THEN HOOK UP THE WIRES. THEN ASK A GSI TO VERIFY THE CONNECTIONS. ONLY THEN CAN YOU SWITCH ON THE POWER ON THE SIDE OF THE BREADBOARD. TOO MANY OF THESE LEVITATORS HAVE GOTTEN BURNED OUT DUE TO INCORRECT WIRING. Hook up the appropriately labeled leads (black is ground) to AI7 and AO0. The switch on the magnet holder can be used to disconnect the electromagnet. where the first cloumn is the number of turns, and the second is the light level. Note that the data MUST be monotonically increasing. The routine, Position Calibrator Template.vi has most of the code prewritten. Finish the routine by following the comments in its block diagram. Use the switch to turn the magnet off. Place the 0.405in ball on the brass screw, and turn the screw until the ball hits the magnet. Lower the ball by turning the screw through a fixed angle. (Use 45degree increments for the first 360degrees, and 90 degrees thereafter.) You can eyeball the angles. The screw pitch is 24 turns per inch; subsequent programs convert the number of turns to mm. Go back to step 2, and repeat until light signal saturates at 10V. When asked, save the calibration data in a file. If necessary, you may use an editor to correct any mistakes you may have made entering the number of turns. As you turn the screw, be aware of backlash; when you reverse directions on any screw or gear positioner, the first 10 to 20 degrees may not result in any lateral movement. You can feel the backlash when you reverse directions; the screw will be easy to turn at first, and becomes significantly harder when the threads re-engage. If you watch the light signal, you can will observe that the screw does not move laterally at first. Because of backlash, you should take your measurements while turning the screw in one direction only. In fact, after you touch the ball to the magnet at the beginning of the calibration, and reverse direction, you should turn the screw until it engages before recording any measurements. It may take a little practice to find the engagement point. Backlash occurs because the threads and gears do not mesh perfectly. This is deliberate; if they did mesh perfectly, friction would make them very hard to turn. Turn the magnet switch back on. The levitator requires your computer’s concentrated attention. Exit out of all extraneous programs, especially programs that require periodic servicing like email browsers, music players, etc. Turn the screw several turns out of the way. Run the file U:\BSC Share\LAB_11\Lab Stations\Levitator\Basic Controller.vi. The first time you run the vi, it will ask you for the location of the your (monotonically increasing) calibration data. Place the ball on the brass screw, and then gingerly lift the ball into place with two fingers, being careful not to block the light beam with your fingers. The ball should levitate. While watching the ball, change the Setpoint in 0.1mm steps. You should be able to see the ball move up and down. Find the range over which the Levitator can hold the ball. Now watch the Chart on the vi. The white curve shows the position of the ball. The green curve shows the drive signal, and is proportional to the magnetic field. The red curve plots the service interval. Three indicators display the Short Term Maximum Service Interval, the Long Term Maximum Service Interval, and the Average Service Interval. The average service interval should be slightly greater than 1ms. If it is much greater, the ball will drop. Use your mouse to move the Basic Controller.vi front panel window. This will distract your computer, and the ball will drop. Open the block diagram. Every iteration through the while loop adjusts the magnet current once. Add a time delay that slows the loop down, thereby increasing the service time. How much time can you add to the service interval before the ball drops? Now add code that inserts a delay every time you push a front panel Boolean control. How long a time delay can the Levitator now tolerate? 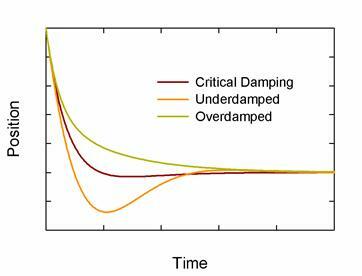 Why is the maximum tolerable continuous delay different from the maximum tolerable intermittent delay? Calculate how long is takes the ball to freefall an appropriate distance. How does this time compare to the times you observe? Look at the DAC output on the scope. How large are the excursions? Change the size of the proportional gain. What happens to the size of the excursions? How large and small can you make the gain? Restore the proportional gain back to -10. Now change the derivative time Td. Over what limits does the ball stay under control? Restore Td back to 100u. Change the integral time Ti to zero. Does the ball levitate? How far is it from the setpoint position? Now run the program Impulse Response.vi. This vi briefly changes the setpoint, and plots the response. Scan the derivative time Td over the range that the ball stays levitated. How does the response vary? When does the ball oscillate? How does the stabilization time change with Td? http://library.lanl.gov/numerical/index.html This book is listed as a supplement; read it if you want to learn more about the numerical techniques. Real-time signals are those which you receive as in infinite train of periodic samples, and which you wish to analyze as your receive each sample. Other techniques, like Fourier Transforms, can be better when you receive your entire sample before you begin processing. A series of amplifiers in which each amplifier is fed by the output by the previous amplifier in the chain. The convention used here has no overall multiplying constant; other conventions are used that multiply this expression by some factor related to pi. A smoothing filter outputs a running average of its inputs. Its action is similar to that of a low pass filter. Two definitions will clarify this discussion: A process variable is some measured value that characterizes the system; the setpoint is the desired level of the process variable. See the LabVIEW PID Control Toolset User Manual.